Technical gear for sport climbing and ice climbing, but also aid climbing, mountaineering, caving, via ferrata, multi-pitch climbing, canyoning… Headlamps for climbing, trail running, sailing, fishing or any pursuit that requires hands-free lighting. To see the full product range please visit the PETZL SPORT WEBSITE. We do not sell Petzl products directly to the public, please use our Dealer Locator from the menu above. Durable and very versatile, the BOREO helmet is suitable for climbing, mountaineering, caving, via ferrata, canyoning… Thanks to its hybrid construction, the helmet is both compact and head-covering. Protection against lateral, front and rear impact is reinforced. Optimised volume on the head and wide ventilation holes make it a comfortable helmet for all activities. 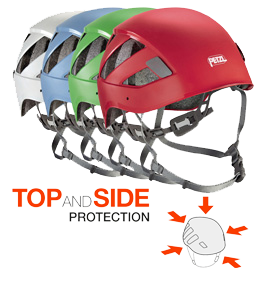 TOP AND SIDE protection now offers Australian climbers an unparalleled head-covering design for optimal protection against lateral, front and rear impact due to its lower in the rear design and that it offers reinforced protection for your head. Available in a range of colours. 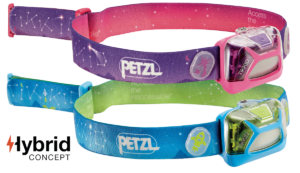 Easy to use and compact, TIKKID is the first Petzl headlamp designed for children. It has a flood beam that offers comfortable vision for reading or playing, inside the house or out. The headband, releasable under tension, and the protected battery pack make it especially suitable for young children. The 20 lumens of power in high mode has been designed and tested to limit photo-biological risk and protect sensitive young eyes. Of course, the TIKKID is weather resistant to IP X4 and as it’s a HYBRID headlamp it comes with three standard batteries and is also compatible with the CORE rechargeable battery.